I finished Beryl Markham’s remarkable memoir and immediately had to know more about her. Who was this woman who was described by Ernest Hemingway in this way: “she has written so well, and marvelously well, that I was completely ashamed of myself as a writer….she can write rings around all of us who consider ourselves as writers.” High praise from some one who was not known to think highly of other writers. So why haven’t I ever heard of her? Surprisingly, this was her only literary effort. And what an effort it was. We follow her life as she trains racehorses for a living, scouts the bush country for elephant, and delivers mail and passengers by airplane to the remote corners of Africa. So many times I found myself furiously marking passages because the writing was just staggeringly beautiful and eloquent. Beryl Markham was born in England, but grew up with her father in Kenya in the early part of the 20th century. Her childhood afforded her considerable independence; on her father's farm she mingled freely with native people and even learned to hunt game. As a young woman she became an accomplished horse trainer, and then learned to fly aircraft. This memoir takes the reader up to her most notable aeronautic feat, being the first woman to fly the Atlantic Ocean from east to west in 1936. Beryl's childhood and young adulthood were fascinating. Hers was far from a typical colonial upbringing, and it seemed she was almost exclusively in the company of men. She was one of very few women in the horse racing world, but proved herself to the skeptical and more experienced. Later, she flew her plane on scouting missions for safari operators -- again, probably the only woman to make a living in this way. Reading this memoir, I was fascinated with her life experiences, although I found the elephant safari segments extremely unsettling. While she focused entirely on her role -- locating herds and reporting back to the safari leader -- and didn't glamorize it in the least, Beryl clearly contributed to the slaughter of elephants for ivory. This was acceptable practice at the time, but it's still awful when seen through 21st century eyes. West With the Night was also surprisingly devoid of women. Beryl's mother left her father, she had no female friends growing up, and her professional colleagues were all men. Was this reality, or due to the scope of this memoir? An amazing memoir written by a pioneering aviatrix about her early life in British East Africa (now Kenya) as a farmer's daughter, race horse trainer, and eventually, bush pilot delivering mail, supplies, and ferrying people across the uncharted territory of eastern Africa. Her exquisite prose makes the book. The story is exciting and interesting, almost unbelievable (I supposed teen aged white women could go hunting lions accompanied only by African tribesman and equipped only with a spear!) but told with such clear and image evoking words that the reader just sinks into this book. It is a book to be savored, read slowly, marked up, and read again. (speaking of a 'pet' lion kept by her father's farmhands: "He spent his waking hours..wandering through Elkingtons' fields and pastures like an affable, if apostrophic, emperor, a-stroll in the gardens of his court." "One day the stars will be as familiar to each man as the landmarks, the curves, and the hills on the road that leads to his door, and one day this will be an airborne life. But by then men will have forgotten how to fly; they will be passengers on machines who conductors are carefully promoted to a familiarity with labelled buttons, and in whose minds knowledge of the sky and the wind and the way of weather will be extraneous as passing fictions." (this book was written in 1942, and she was relating this as she spoke of her early flying lessons around 1925-30. "You could expect many things of God at night when the campfire burned before the tents. You could look through and beyond the veils of scarlet and see shadows of the world as God first made it and the hear the voices of the bests He put there. It was a world as old as Time....When the low stars shone over it and the moon clothed it in silver fog, it was the way the firmament must have been when the waters had gone and the night of the Fifth Day had fallen on creatures still bewildered by the wonder of their being." "...she has written so well, and marvelously well, that I was completely ashamed of myself as a writer. I felt that I was simply a carpenter with words, picking up whatever was furnished on the job and nailing them together and sometimes making an okay pig pen. But she can write rings around all of us who consider ourselves as writers...I wish you would get it and read it because it is really a bloody wonderful book." I'm sorry to say I haven't heard of Beryl Markham until I read this memoir written in 1936, first published in 1942 and reprinted in the 1980s. Markham was born in 1902 and went to what is now Kenya with her father in 1906. Like her father she was a racehorse trainer but she fell in love with flying and became a bush pilot eventually scouting for elephant from the air and working with people like Baron von Blixen. In 1936 she was the first woman to fly solo east-to-west across the Atlantic. "The shores of its lake are rich in silence, lonely with it, but the monotonous flats of sand and mud that circle the shallow water are relieved of dullness, not by only an occasional bird or a flock of birds or by a hundred birds; as long as the day lasts Nakuru is no lake at all, but a crucible of pink and crimson fire - each of its flames, its million flames, struck from the wings of a flamingo. Ten thousand birds of such exorbitant hue, caught in the scope of an eye, is a sight that loses credence in one's own mind years afterward. But ten thousand flamingos on Lake Nakuru would be a number startling in its insignificance, and a hundred thousand would barely begin the count." Lifetime memoirs by British-born Kenyan author Beryl Markham (1902-86) about her frontier life growing up in colonial Kenya. An intimate portrait of a romantic, fragile and ephemeral time in Africa. Although Markham was the first person to fly solo across the Atlantic from east to west, she is best known today as the author of this book because of its amazing writing. Hemingway (who knew Markham fairly well) said "she can write rings around all of us who consider ourselves writers." National Geographic Magazine rated it #8 in its "Top-100 Adventure Books". Many of the real-life characters seen in the movie "Out of Africa" are discussed here, including how the character played by Robert Redford dies, and how Markham almost died with him. Beryl Markham's compelling memoir of growing up in British East Africa. She is best known for flying solo from England to North America and she ends her book with this story. But the rest is about running wild on her father's farm as a child, learning to hunt and having lion-centered adventures; becoming a professional horse trainer at 17; and her life as a bush pilot in Africa between the wars. It's hard to describe the simple beauty of this piece of work. Everything I could write about this book to praise it's poetic and elegant artistry would not be fair. Beryl Markham's writing inspires me to look at the world with a new perspective and wonder. A beautifully written combination of autobiography and whimsy. Beryl Markham led a fascinating life. . Born in Britain in 1902, she spent much of her life in Kenya, working as the only female airplane pilot in Africa. She was also a racehorse trainer, and her memoir details her childhood and adulthood in Kenya. Markham had a wide range of friends and acquaintances, among them Karen Blixen and her lover, Denys Finch-Hatton. What a joy of a book! 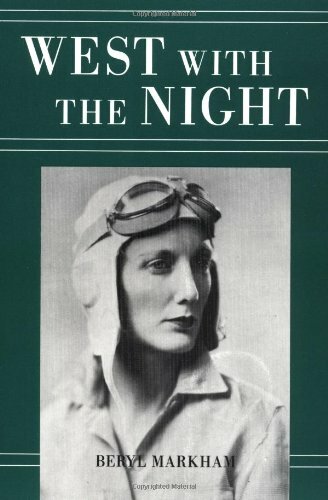 In "West with the Night," Beryl Markham tells the stories of her youth, culminating with her flight, referred to in the title, from England to North America. Her stories are amazing. Markham grew up in Kenya in the early 1900s--she and her father relocated there when she was four. Her father was a farmer and mostly a thoroughbred horse breeder and trainer. She learned to hunt from the tribal leaders living near the family's farm when she was just a girl. At 17 after her father went bankrupt and decided to move to Peru, she chose to stay in Africa and make her own way, which she did by becoming a horse trainer like her father. Finally, she was drawn to become a pilot and taught to fly by a man who would become a famous British pilot, Tom Black.